it´s been half a year since last newsletter, so I thought it would be time for an update. I start with my current exhibition at Kristiansand Kunsthall, my biggest solo show so far in Norway, with almost 500 m2 of exhibition space. I am showing 5 works there: Circle (2011), in transit (2012), revolver (2013), Barents (2015) and the new installation beacon (2016). The exhibition is a collaboration with punktfestivalen, and also included a performance of mikro in collaboration with Justin Bennett. Three light projectors suspended from the ceiling slowly scanning the space. Each light projector consists of a light that orbits around a container of glass filled with water. The water and glass works as a lens, focusing the light into a strip of light that moves around, like an inverted lighthouse. Light projection on a custom built wall and floor. 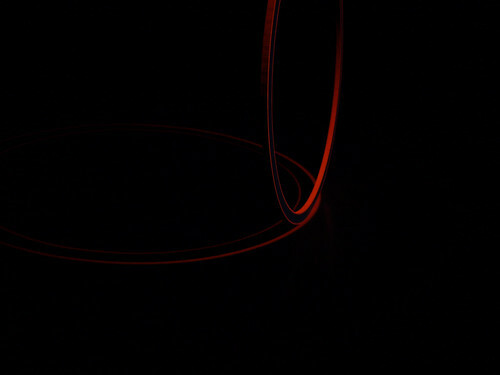 A black and white form on a red background slowly changing shape and moving along the horizon. Inspired by Gunnar Tollefsens paintings “rød speiling” and “blå speiling”. Created for the group exhibition “Mitt Landskap” at Bodø Biennale across three venues: Stormen, Bodø Kunstforening and Bodø Domkirke. The other artists in the exhibition: Siri Austeen, Johanne Hestvold, Linn Halvorsrød, Olav Christopher Jenssen, Edvine Larssen and Vemund Thoe. For the third Dark Ecology journey which took place in June, I was commissioned together with Justin Bennett to make a new version of our performance collaboration mikro. Mikro series is an audiovisual improvised performance where we use material found at the location we perform. For Dark Ecology we collected materials from the whole journey: Pasvik, Nikel, Kola superdeep and from the processing plant in Kirkenes where we performed. During the performance I use a microscope to examine and capture the textures of the various materials found, while Justin uses various microphones to sample and process sounds he creates from the materials. We also got a chance to perform this at Kristiansand Kunsthall as part of punktfestivalen in the beginning of September. We enjoy this collaboration and would love to do more performances, so please be in touch if you know of a suitable venue/occasion. The Dark Ecology team has created a beautiful book summing up the three Dark Ecology journeys. I have been so fortunate to be part of all three journeys and I am happy to be included in the book! I showed an outdoor version of spin at Øyafestivalen, Norway´s largest music festival that took place in Oslo in mid-august. Barents will be shown at a one-night event at the van Gogh Museum in Amsterdam on October 28th. A collaboration between Sonic Acts and the museum. I will participate in a artist laboratory project at theANTI Festival, Kuopio, Finland end of October, as part of the bigger project “Future DiverCities – Creativity in Urban Context”. Solo exhibition at Rake Visningsrom in Trondheim in November, really looking forward to doing something at this place. …and a few unconfirmed projects that will hopefully happen. it´s time for a newsletter on this bonus day, with a look back at the projects I completed at the end of last year and the beginning of this year. Also I have finally updated my website, please have a look at the projects section. Barents (mare incognitum) is a large-scale projection of the ocean slowly rotating, filmed with my orbital camera. More specifically it´s the Barents Sea, filmed at the border of Russia and Norway, pointing towards the North Pole. It was shown in Nikel as part of the Dark Ecology journey which took place in the border area between Norway and Russia in the end of November. In December it was shown for a week at the EYE Filmmuseum in Amsterdam. In January it was shown outside Kulturkirken Jakob as part of Klimafestivalen §112. Another project for Dark Ecology: Pulses of light passing over an unfinished structure of concrete slabs sticking up from a frozen dam. A total of six lines of light were suspended over the 20x20m area in the industrial zone of Zapolyarny, Russia. a live collaboration with phonophani (Espen Sommer Eide) at Bergen Kunsthall Landmark for the 15th anniversary of BEK. Sadly not a lot of documentation from this performance which was the first time I collaborated with Espen. You will hopefully get the chance to hear some of the music in a future release from phonophani. I used the orbital camera as a live camera for this project with the idea of three different motions for the three different parts in the music: panning, rotation and combining panning and rotation. On a very cold evening in January lots of people came to RAM Galleri in Oslo to experience my collaboration with sound artist Alexander Rishaug. It was the 4th version of Spaces Speak, audiovisual evenings curated by Ricardo del Pozo and Joakim Blattman. Rishaug created different soundscapes centered around his large Leslie cabinet with a rotating speaker and I showed the light installation Revolver. It´s been a long and busy autumn for me, but the dark times are not over yet! Below you will find information about projects just about to happen, ongoing and completed projects since end of August. Just before the climate summit starts in Paris I will take part in the second Dark Ecology journey in the border area between Norway and Russia. During my residency in September in Nikel and Vardø I ended up with two projects I wanted to realize and thanks to the amazing production team they both seem to be happening! Both projects are outdoors: In Nikel I will show Barents (mare incognitum), a large-scale projection of the ocean slowly rotating, filmed with my orbital camera. More specifically it´s the Barents Sea, filmed at the border of Russia and Norway, pointing towards the North Pole. The second installation is the crossing, a light motion installation in a very Stalker-like environment outside Zapolyarny. Check out the complete Dark Ecology program. A cinematographic weather report at the Eye film museum in Amsterdam, with a few projects from Dark Ecology. I will give a presentation of Barents (mare incognitum). In the week ahead of the event, the Barents video will be screened for an hour every day at the EYE. 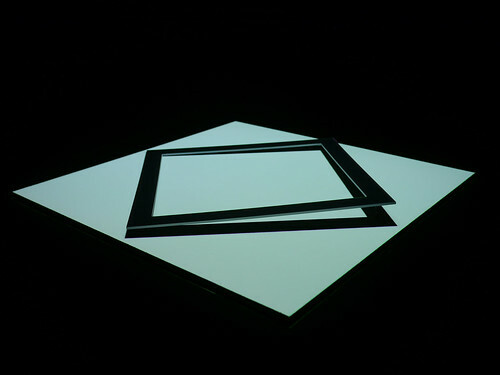 For my current soloshow at Kunstbanken I am showing a new version of the projection installation blink as well as the light installation revolver. A light-motion installation created specifically for the gallery space situated inside the metro station of Carl Berner in Oslo. I have lowered the ceiling by hanging the grids from the existing light fixtures and replaced the lights with moving light pulses. An outdoor version of in transit X presented in the beautiful courtyard of the Church of Our Lady of Snows in the center of Prague as part of the light art festival Signal Festival. a kinetic installation with flip dots created for the pavillion of Galleri Lynx in Oslo as part of the Norwegian Sculpture Biennale 2015. A mechanical repetative motion propagating the room through sound, light and shadow. The last four months has been a continuation of my interest in working with motion through spaces, objects and landscapes, and the relation between the ephemeral medium of light and physical structures. 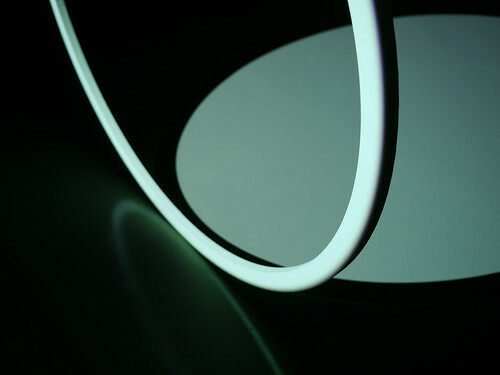 This has resulted in a series of light-motion installations as well as the development of a completely new series of works called Orbital. Orbital is based on an idea of exploring spaces and landscapes using a video camera that slowly rotates around its own axes, and captures the world that rotates around it. 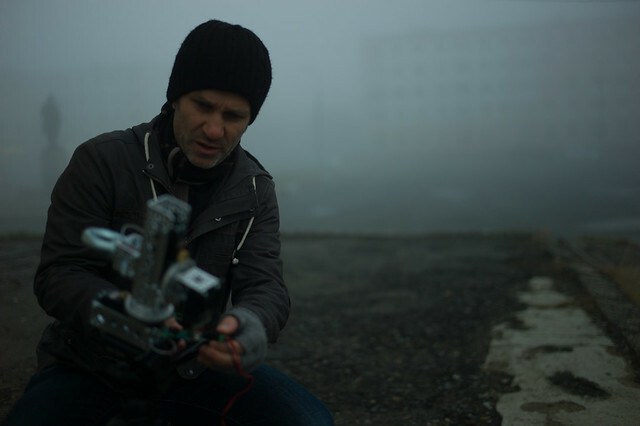 The camera is like a probe that can be brought along on expeditions in both friendly and unfriendly environments, and is partly inspired by the camera that Michael Snow got constructed for his film La Region Centrale from 1971. Snow´s camera was so big it needed to be flown in with a helicopter to a remote mountain region in Canada, while my expedition camera fits in a small bag and can be used to explore both small and large environments. A few confirmed activities for next year is my participation at Adelaide Arts Festival with a big new outdoor light-motion installation in end of February, my second solo show at Woodstreet Galleries in April and a book release. Since it´s been a while since my last newsletter I will not go into detail with each project, but I encourage you to check out the video links. I start with the most recent project and work my way back to the summer. 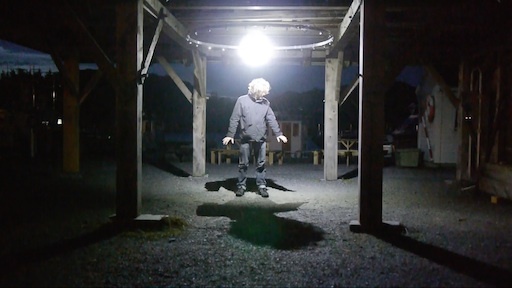 I showed three installations at this year´s festival: Revolver 2 in Solund Church, spin in the harbour of Hardbakke and kile/wedge on an island in the harbour. Three artists were invited this year: Viel Bjerkeset Andersen, Ellen Røed and myself. I presented the first video in my orbital series, made using my custom built rotating camera. I filmed inside a gymnastics rehearsal space, recording slow rotational movements of the camera in the space. The other artists in the show: Book and Hedén, Holm and Jørgensen, Berge and Havneraas, Konow-Lund, Stensland. 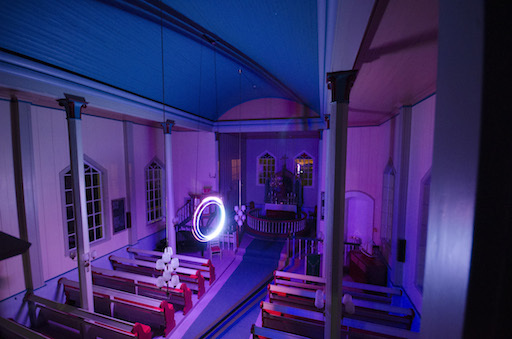 I showed a large light-motion installation inside the church, a continuation of previous in transit installations. Laila Kongevoll and Trine-Lise Nedreaas was also part of the exhibition. 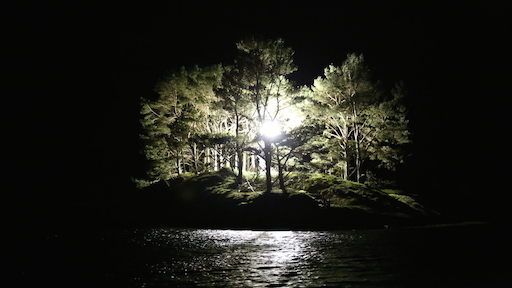 I had the chance to participate in the Dark Ecology journey in the border area of Norway-Russia, organized by Sonic Acts and Hilde Mehti. I did some preliminary sketches using my orbital camera. I presented a new version of the light-motion installation trace at Todays Art at the beach outside Den Haag in a building that used to be the archive for the war-crime tribunal for former Yugoslavia. I showed the light-motion installation spin inside a former cement factory. 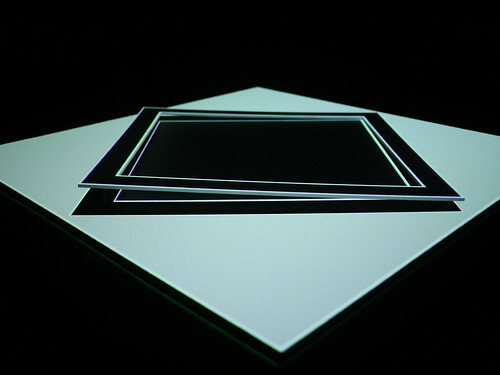 I got the opportunity to present 7x7cirkler at Klangum 14, the light installation I created for Else Marie Pade´s 7 cirkler which was initially shown in the unheard avantgarde section of the Sound Art exhibition at ZKM in 2012. This summer the Wind-up birds resided in the beautiful German countryside. 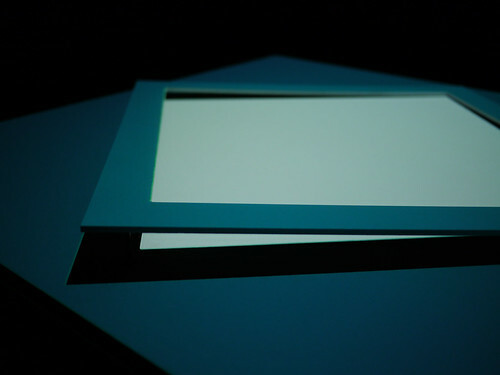 The 2nd version of Projected Light Object: Frame at my exhibition at Woodstreet Galleries. 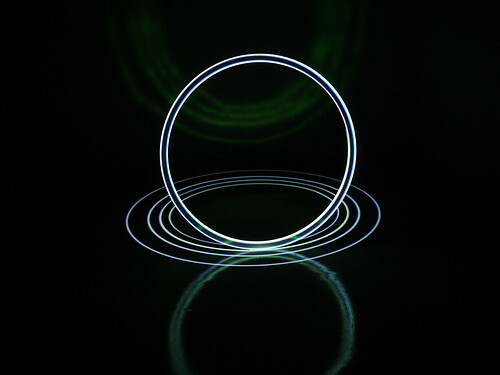 The 4th version of Projected Light Object: Circle at Woodstreet Galleries. More images of the different circles.